While winning the turnover battle being the key to winning football games is cliché, the old adage held true for Staley (3-0) until lightning suspended its quest for a fourth straight shutout Friday night at Greene Stadium on the campus of William Jewell College in Liberty. The third turnover of the night, and second by Liberty North (2-1), gave the Falcons a big lift in a game that only featured one touchdown in the first half. On the first play of the second half for the Eagles — after nearly coughing up the kickoff — Staley forced a fumble and senior linebacker Monterio Whiles scooped it up and weaved 20 yards for a touchdown with just 14 ticks off the third-quarter clock to push the visitors’ lead to 14-0. The Falcons defense rose to the occasion all night, only allowing Liberty North to cross midfield just twice, and only once after its first drive of the game. After taking over on its own 23-yard line after forcing a three-and-out, the Eagles moved the ball downfield using a quick passing game. Once they got inside the Falcons’ 40-yard line, senior quarterback Michael Wansing took a shot downfield on third down toward senior wideout Jack Degarmo, who was two steps behind the Staley defense. The pass hit Degarmo in the hands, but fell to the turf and the Eagles ended up turning the ball over on downs when senior running back Myquan Powell was stuffed on fourth and short. After the Eagles committed a turnover of their own on their next drive — a fumble on a pitch attempt — they rose to the occasion on defense, forcing one of their five three-and-outs before the game was suspended. 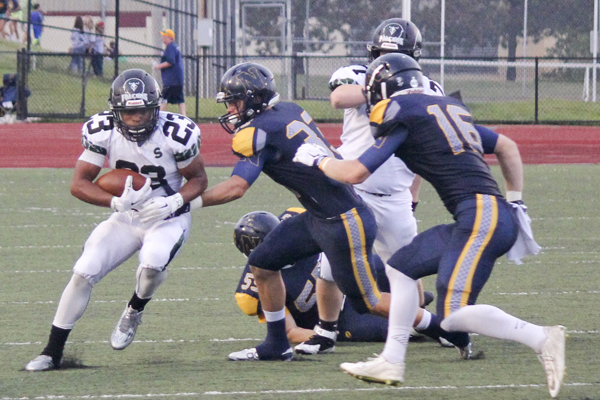 With 9:17 left in the first half, Staley junior Julian Ross bulldozed his way into the end zone from 6 yards out for the lone score of the first half. Ross got the start in place of senior Faziol Bouchard, who injured his knee last week in a 40-14 win over William Chrisman and will miss the rest of the season. Staley senior defensive back Gore Pitia wrapped up the first half, picking off Wansing deep in Staley territory after a late hit penalty moved the Eagles across the 50 for the second time all night. After the initial lightning delay with 4:26 to play in the third quarter at 8:42 p.m., the game was suspended at 10:28 p.m. and was resumed at 2 p.m. Friday at Greene Stadium. When play resumed the teams traded field position with Liberty North gaining momentum only to fumble twice on Staley’s side of the field. The Falcons would then put a nail in the coffin when quarterback Mike Kirkpatrick rumbled 79 yards for a score with 7:37 left in the game. That score would make it 21-0 and Staley would close it out from there. The win moves the Falcons to 4-0 on the season and sets up showdown with a 4-0 Fort Osage next week at Staley. North falls to 2-2 and will play at Grandview next week.